Shop till you drop at Provenance Arts and Outstation Gallery - Aboriginal Art from Art Centres. Visiting Nature & Wildlife Tours and Mindil Beach will get you outdoors. Step out of Darwin to go to Batchelor and see Litchfield National Park, which is approximately 1h 20 min away. Next up on the itinerary: see the interesting displays at Museum & Art Gallery of the Northern Territory, explore the galleries of Nomad Art Gallery, look for all kinds of wild species at Crocosaurus Cove, and take in the exciting artwork at Mason Gallery. To find more things to do, maps, reviews, and other tourist information, read our Darwin road trip planner. Manchester, UK to Darwin is an approximately 27-hour flight. The time zone difference when traveling from Manchester to Darwin is 9 hours. Expect much hotter temperatures when traveling from Manchester in October; daily highs in Darwin reach 39°C and lows reach 28°C. 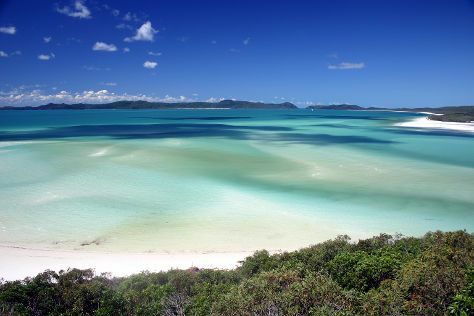 Wrap up your sightseeing on the 9th (Fri) early enough to travel to Whitsunday Island. Kick off your visit on the 10th (Sat): explore the activities along Hill Inlet and then enjoy the sand and surf at Whitehaven Beach. To see reviews, traveler tips, photos, and more tourist information, you can read our Whitsunday Island trip planner. Fly from Darwin to Whitsunday Island in 12 hours. Alternatively, you can do a combination of flight and bus; or take a bus. Expect a bit cooler temperatures when traveling from Darwin in October; daily highs in Whitsunday Island reach 34°C and lows reach 19°C. Finish up your sightseeing early on the 10th (Sat) so you can travel to Hamilton Island. Start off your visit on the 11th (Sun): see some colorful creatures with a scuba or snorkeling tour. On the 12th (Mon), you'll have a packed day of sightseeing: view the masterpieces at Hamilton Island Art Gallery, then stroll through Catseye Beach, and then get outside with Jetryder. Quickly create a custom-made itinerary for Hamilton Island using our trip planner. Use the Route module to find suitable travel options from Whitsunday Island to Hamilton Island. Traveling from Whitsunday Island in October, expect a bit warmer with lows of 25°C in Hamilton Island. Finish your sightseeing early on the 12th (Mon) to allow enough time to travel to Gold Coast. Museum-lovers will appreciate Tweed Regional Gallery & Margaret Olley Art Centre and Queensland Art Gallery. Take a break from the city and head to Lone Pine Koala Sanctuary and Burleigh Heads Beach. Explore the numerous day-trip ideas around Gold Coast: Moffat Beach (in Caloundra) and Brisbane (The Henderson Gallery & Relove Oxley). Spend the 15th (Thu) exploring the fascinating underwater world at Sea World Theme Park. There's still lots to do: enjoy the sand and surf at Surfers Paradise Beach, browse the different shops at Pacific Fair Shopping Centre, explore the striking landscape of Burleigh Head National Park, and identify plant and animal life at David Fleay Wildlife Park. Traveling by combination of flight and train from Hamilton Island to Gold Coast takes 5 hours. Alternatively, you can do a combination of ferry, bus, and train; or do a combination of ferry and bus. Traveling from Hamilton Island in October, Gold Coast is slightly colder at night with lows of 18°C. 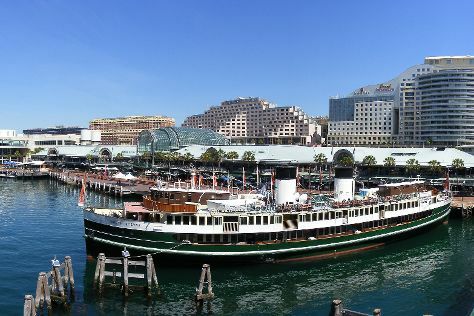 Wrap up your sightseeing on the 17th (Sat) early enough to travel to Sydney. Shop till you drop at Brett Whiteley Studio and ATTY Gallery. Step out of the city life by going to Manly Beach and Dolphin & Whale Watching. And it doesn't end there: enjoy the sand and surf at Bondi Beach, get engrossed in the history at Justice & Police Museum, take a stroll through Darling Harbour, and look for gifts at Sydney Fish Market. To find where to stay, more things to do, maps, and other tourist information, read Sydney trip builder . Fly from Gold Coast to Sydney in 3.5 hours. Alternatively, you can do a combination of train and flight; or drive. October in Sydney sees daily highs of 28°C and lows of 17°C at night. Finish up your sightseeing early on the 23rd (Fri) so you can travel back home.